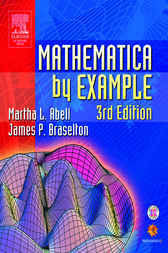 This third edition of Mathematica by Example is completely compatible with recent Mathematica versions. Highly readable and informative, this volume is geared toward the beginning Mathematica user, and focuses on the most often used features of this powerful tool. The book covers popular applications of mathematics within different areas including calculus, linear algebra, ordinary differential equations, and partial differential equations. "The book does an excellent job of providing information that beginning Mathematica users need...The Mathematica graphical output is excellent."